Pocket feat. 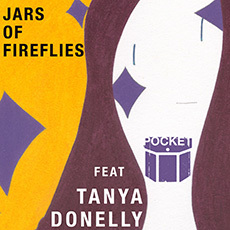 Tanya Donelly - "Jars Of Fireflies"
Pocket feat. Django Haskins - "Sleep When You Are Dead"
The eighth release in Pocket’s Collaboration EP Series – EIGHT IN ONE YEAR! Tanya Donelly (Belly, The Breeders, Throwing Muses) lends a mesmerizing meditation on the illuminating insects of a late summer’s evening. The B-side features a twangy guitar driven track with vocals from Django Haskins of pop-noir musical group The Old Ceremony. Includes remixes from author Rick Moody (The Ice Storm / Garden State), Berlin-based producer/musician Mount Sims & Scott Milton (Catalog / The Present Moment).